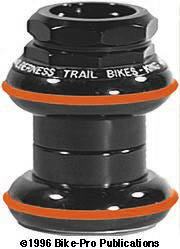 Wilderness Trails has created the Grease Guard variety for the headset. The basis for the Grease Guard head set is the Chris King headset. The WTB model includes a special groove on the cups, with a hole in it to inject Goose Grease. Here are the details. This headset is made of the finest materials, and done to the highest standards of workmanship any human can expect. The headset is comprised of five parts. The fork race is made of stainless steel. Because it's subjected to water and mud Stainless is the only material to consider. The race is machined to fit closely into the lower cup with it's bearing cartridge. Both bearing cups are machined aluminum to achieve perfectly round pieces, with flat facings, and exact seatings for the precision sealed bearing cartridges. Both of the bearing cups also have a half-round groove that runs around the outer circumference with a small flat spot. The cups at that point are anodized Black or Silver. Through the groove there is one small hole drilled. This hole is for the Goose Greaser ( WTB's grease injector) to inject replacement grease into the headset system. The groove is to seat a large rubber O- ring that rolls into the depression and keeps the drilled hole clean. The rubber ring is orange in color, which is what gives this headset it's orange stripe. To hold the fork to the head set there are two aluminum pieces, the adjusting nut and the head lock nut. Each is machined to their final shape and thread pattern, and finally anodized Black or Silver. The adjusting nut closes off the bearing to the elements and secures the parts, while the head lock nut holds the adjusting nut so it can't back off. This headset requires about 5/16" more stack height than some original equipment headsets. The use of stainless steel precision bearings in this headset will give it a long life. Made only in the 1" size, with English threads, in Black or Silver. Weighing 107.5 grams, it has a 42.9mm stack height.